This is the full manifest page from the 1901 arrival of SS Victoria on May 1, 1901. 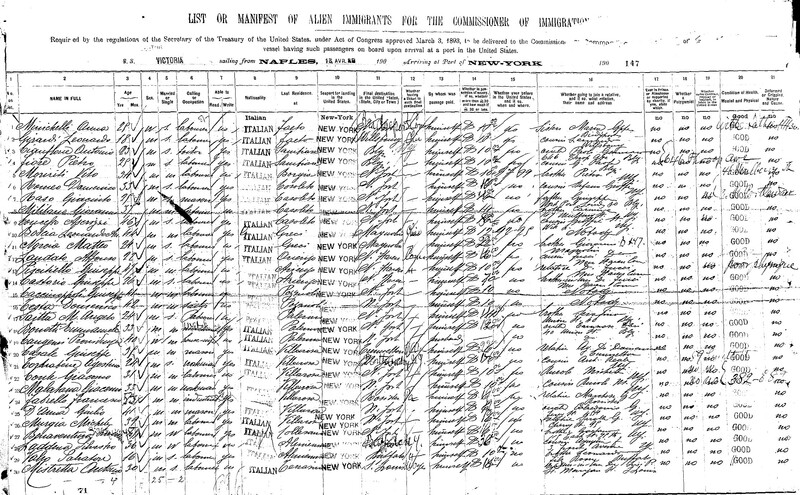 Buonaventura's entry on line 27 is a classic example of the imperfections of record keeping at Ellis Island. Even the printed correction above the last name has been incorrectly indexed as "Giragino." His age, ability to read and write, status as a widower and the date of arrival all fit into his immigration timeline. The only mystery that remains on this manifest is the identity of the person ("brother Gaetano") he indicates as his contact in the United States. Gaetano was likely a cousin or friend that he felt compelled to turn into a closer relative. Of all the Siragusas from Collesano that have come through Ellis Island, Buonaventura was the first.